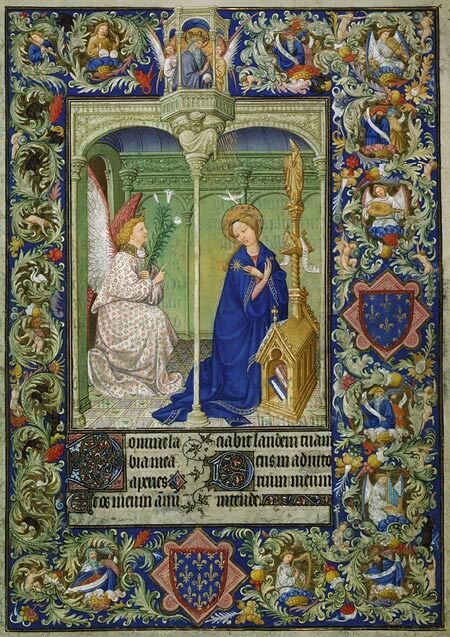 The annunciation, Limbourg Brothers, The Belles Heures of Jean of France, Duke of Berry*. Ink, tempera, and gold leaf on vellum; The Cloisters Collection. Metropolitan Museum of Art. ca. 1406-09. *Item, une belles Heures, tres bien et richement historiees (Item, a beautiful hours, very well and richly illuminated). In the Middle Ages books were usually displayed on ornate stands [detail above from The Belles Heures]. Since books were scarce and quite valuable it was not unusual for books to be chained to their stands as a measure against theft. Les Belles Heures (Item, une belles Heures, tres bien et richement historiees [Item, a beautiful hours, very well and richly illuminated]) features exclusively the illumination work of the Limbourg Brothers: Herman, Paul and John. Commissioned by Jean France, Duke of Berry, in 1405, the brothers finished the book in 1409. The Limbourg brothers were unusually close to the duke and received commissions from him for several different book of hours. In this version, they added more artwork than originally planned, creating seven picture book cycles with three to twelve full page illuminations in each cycle. This illumination is noted for its strong emotional content, unusual for painting during this period. The book is presently in the Cloisters Collection of the Metropolitan Museum of Art (New York).